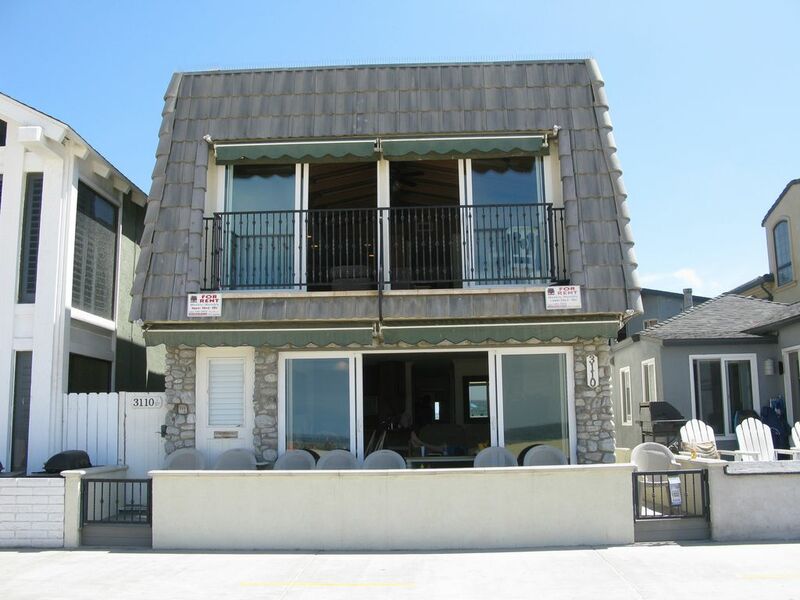 Newport Beach House- OCEANFRONT - 4 bedroom - upper unit - Best Location !!! Rent Weekly or Monthly-Special lower winter/spring rates. facing the water? This is it! water views, beautiful sunsets and to feel the ocean breezes. The location is fantastic and the only reason why i gave it two stars instead of 1. The house is run down and outdated with old oak paneling type material everywhere. The furniture shown in the pictures is not the actual furniture in the house. The sofas are old cloth, not leather. There were no quilts on the beds (as shown in the pictures) and no extra blankets to use. There was no blow dryer in the house. The dining table is not the one shown in the picture. We had an old broken down table with a broken chair. The owner falsely accused us of breaking the chair (it was already broken when we arrived) and charged us $100 off our damage deposit. The location is the only saving grace for this house. We thoroughly enjoyed our Christmas getaway at Dianne's quaint beach house! The kitchen was fully stocked with all of our cooking needs, the house was nice and spacious and very clean. The location was perfect! We look forward to staying again in the future. Wonderful host. Great home with all the things you need to have meals at the house and play at the beach. Great location close to restaurants and good places as well. loved the house. Has all the amenities, and was the cleanest of any place we've ever stayed. Owner was super friendly and easy to work with. We rented the top 4 bedroom unit with 5 adults and one child. It was a great stay! This unit has all the amenities you would ever need, plus two sets of sliding glass doors so you can take in all the views. The beach directly out front of this unit is spectacular and it's a very easy walk down to Newport Pier where there is always something to do. Also, Pavillions Market (owned by Safeway) was a flat, easy 5 minute walk. Dianne was very easy to communicate with and willing to communicate via text, email, or phone if needed. There were plenty of toys to play in the sand, boogie boards, and tons of beach chairs. This is a well stocked house and should fit all your needs! Thanks again Dianne! We hope to return again soon! Super clean and all the comforts of home. Tv's in many rooms, plenty of pots, pans, utensils. Everything you need for a perfect vacation. Will be recommending this place to friends. Great value. banana. Marvel at the skilled body surfers at the world-famous Wedge. Swimming, Jet Skiing, Harbor Cruises, Boating and Whale Watching. Rent a duffy boat and cruise around the harbor. courts. Day or Night, Newport Beach offers something for every one….